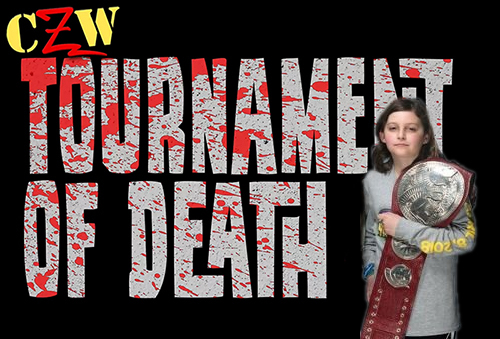 Headlies: Nicholas To Face Necro Butcher At CZW's Tournament Of Death - WrestleCrap - The Very Worst of Pro Wrestling! Townsend, DE – The wrestling world was stunned today with the announcement that former WWE tag team champion Nicholas will be taking on the Necro Butcher at CZW’s Tournament of Death. The event, which takes place in an empty field in Delaware, has become famous for extreme acts of violence and mayhem. It is not uncommon for wrestlers to leave bloody, broken, and burned. Thanks to the state’s lax child safety laws, the match will be a bloodbath. “After Wrestlemania, every wrestling company in the world wanted Nicholas,” said the 10-year old’s father John Cone. “TNA, ROH, PWG, LMNOP. They all want him, plus all the major conventions. Nicholas must finish all his homework first, then he can be in a deathmatch. Nicholas is currently deciding if he wants to bring light tubes or a pair safety scissors to the match. 6 Responses to "Headlies: Nicholas To Face Necro Butcher At CZW’s Tournament Of Death"
OK, I’m confused. When did Nick win (and subsequently lose) the WWE tag belts? He was Strowman’s secret partner (well, insomuch as Braun came out without a partner and pulled him out of the crowd “randomly”) at Mania and got to watch as Braun destroyed the Bar by himself. Then he gave up the titles on Raw as Nicholas had schooling to complete. “Won” at Wrestlemania as Strowman’s “mystery” partner. “Lost” the next night when they relinquished the titles due to him being in school….or something. I’d go with the exploding Play-Doh, myself. At least his father cares about his education.